We offer FREE embossing for all of our products. 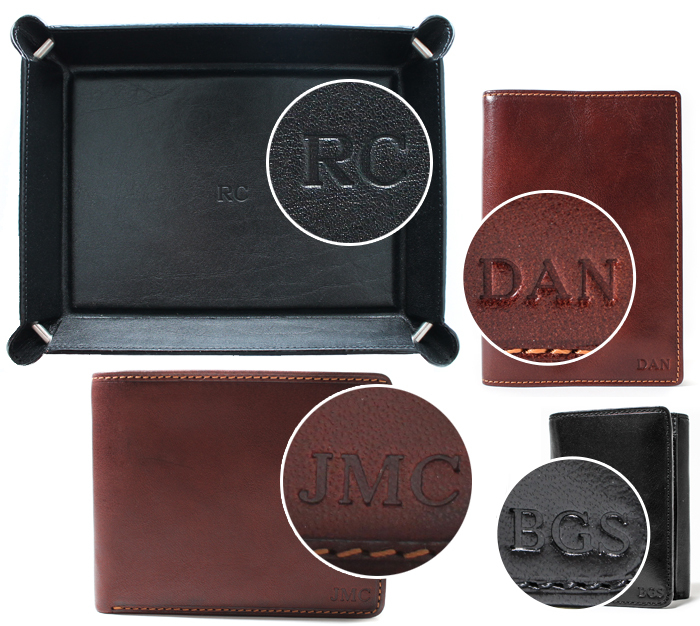 We do our embossing in-house, allowing us to deliver your personalized leather product without added delay. How we emboss: We can emboss numbers, upper case letters, and special symbols in two fonts; Arial and Times New Roman. We do a blind stamp embossing where we take a machine that heats aluminum dies, then stamp the initials/numbers/symbols to make an imprint on the leather. What we emboss: We typically restrict the embossing initials and letters to three(3) characters because this is what most of our products allow room for. 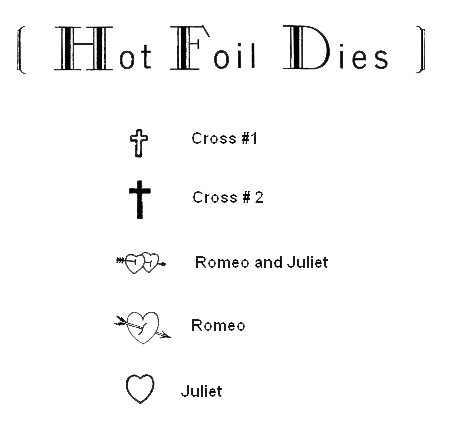 However, it is possible for us to emboss more characters free of charge if the product purchased has (1) sufficient room to emboss (2) does not have any surface or under-surface impediments that complicate the embossing (3) we have enough characters/letters to complete the embossing. Where we emboss: The placement of the embossing depends on the product itself, and we take special care and attention to ensure the embossing is aligned and centered properly to the proportion of the product, in such a location where the embossing is easy to see but also not overly flashy. 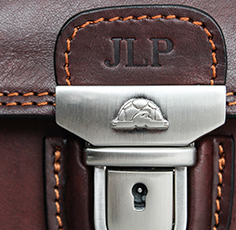 In our briefcases, we typically emboss on the small leather tab above the clasp closure. If the briefcase does not have this leather tab, then we will emboss on on the top of the bag centered. Most of our wallets and smaller accessories we emboss on the bottom right hand corner of the wallet. Special Requests: In such cases where you have a preference of the placement of the embossing, any special symbols, or if you wish to emboss more characters you can reach out to us or leave us comments on your order with your instructions. We will meet this request if it is possible for us to do so. In such cases where the request is not possible, we will reach out to you and work with you to find a solution suited for you. Embossed products are non-returnable. In the unlikely case you received your product with the incorrect initials, or the the incorrect product altogether, please reach out to us and we will rectify the solution to your satisfaction by providing a replacement. We emboss exactly how the characters are typed out. Please ensure you have double checked the correct spelling before submitting your orders. All embossings are done in English and we do not have the capability of embossing special characters in other languages, such as acute accent letters. Some smaller products such as keychains or others cannot be embossed due to the size or other irregularities impeding us to make a perfect stamp. In such cases we will reach out to you and inform you. Embossing orders cannot be cancelled after the item has been embossed and shipped, so please keep in mind if you would like to alter or cancel any embossing on an order you need to contact us immediately by phone, or leaving us an email at customerservice@tonyperottiusa.com. 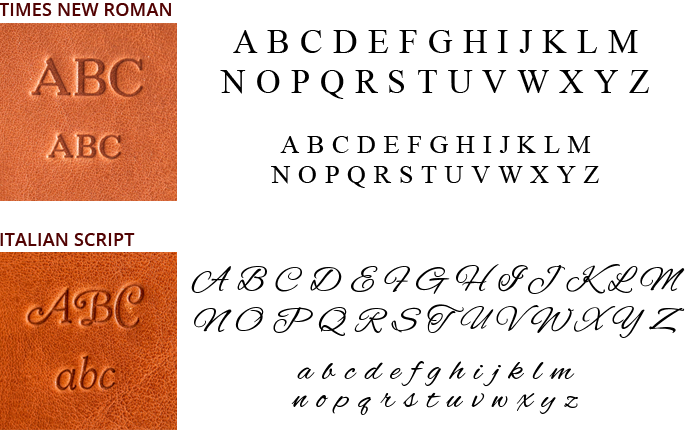 All Tony Perotti leather products can be embossed with your company or personal logo for an additional fee. Contact us for more information.